This review of Clever Cultures For Athlete’s Foot covers all the areas needed to make an informed and wise decision when it comes to buying the product. 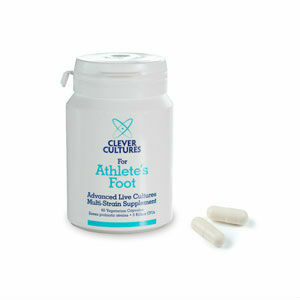 Clever Cultures For Athlete’s Foot are capsules which are used to treat athlete’s foot by strengthening the immune system. Once the course of treatment is finished, it claims to cure athlete’s foot. The product is available on the product’s website as well as on other shopping websites. Read on to find out more about the ingredients that are used in this product as well as to look at the viability of this product. One is required to take two capsules every day. The capsules can be taken as they are or they can be broken down, and the contents can be mixed with food or drink. A bottle contains sixty capsules and can be used for a month. Although these capsules have been made to be taken also during pregnancy, it is recommended that one consults a doctor before taking these capsules. The product is free of the most common allergens like peanuts, shell fish, tree nuts, eggs, and fish. It does contain traces of milk and soy and therefore those who are allergic to these ingredients should consult their doctor before taking these capsules. The cost of one bottle containing 60 capsules, which will last a month is £11.99. There are no other discounts or offers available on this product. The manufacturers of this product provide a 60 day money back guarantee in case the product does not suit a customer. They claim that the product is so effective that no customer will want to return their product. If they do, they will get their money back without any hassles. The customer reviews on the product’s website are positive and all the customers sound happy after taking it. Clever Cultures for Athlete’s Foot is a unique formulation of five live bacteria and seven strains of probiotics and therefore is very safe to use. It cleans the gut and thereby strengthens the immune system. The instructions on how to take these capsules are given clearly as well the money back policy gives a customer the peace of mind to try these capsules. It is made up of entirely natural ingredients and therefore poses no threat to one’s health. However, there are traces of food substances that can cause severe allergic reactions and one needs to consult their doctors before taking these capsules. Moreover, it is an expensive product when compared to its competitors. Jimmy Rodriguez	reviewed Clever Cultures For Athlete's Foot	on November 19th	 and gave it a rating of 3.5.